Moisture problems in existing basements are very common, but often are not understood or properly treated. Most basements are connected to the house, which means they share the same air. In these cases, moisture problems are not only annoying and uncomfortable but can lead to significant health problems. Mold and mildew can grow in damp carpets and beneath wall coverings. Finishing a basement without first dealing with the moisture problems can result in making health conditions worse and lead to significant damage as well. A sealed interior basement waterproofing system, installed by a professional waterproofing contractor, can keep the moisture and soil gases from circulating throughout your home. Sealed interior drain tile systems are one of the most important aspects of residential waterproofing and moisture control. Drain tile systems are also one of the most misunderstood aspects. Because these systems are buried and cannot be easily modified or corrected, it is very important that they are installed correctly. The process of installing a sealed interior drainage system is usually less expensive and less evasive than exterior waterproofing. A perimeter drainage system will still prevent unsightly water on the basement floor and flooding. If it is sealed, a drainage system can turn a basement into a valuable living space. Cracked basement walls will need to be injected with epoxy or polyurethane to seal out water. If cracking is significant, an exterior waterproofing system should be installed. An interior drainage system is not waterproofing. 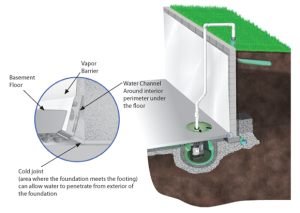 Interior drain systems are water management agents that relieve excess water from around and under your foundation and direct it to your sump pump system. Contact us today to learn more.